You are here: Home / Beauty / Tumeric an Ancient Skin Care Ingredient! 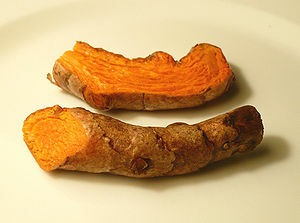 Tumeric an Ancient Skin Care Ingredient! Turmeric, a member of the ginger family, has been one of the most important healing ingredients in Indonesian and Indian medicine. Known for its powerful antioxidant and anti-inflammatory benefits in Ayurveda, turmeric helps maintain skin health by neutralizing toxins and fighting off free radical damage, a key cause of premature aging. In addition, topical turmeric is clinically proven to even out and brighten the complexion. Having only used turmeric in food, I was intrigued with using tumeric on my face. The downside of turmeric is it can leave a yellow stain so test the product out at night the first time you try it. You can make your own mask by blending cosmetic grade turmeric (not the stuff from the spice aisle) and sandalwood powder with a oil appropriate to your skin type or grapeseed which is good for all skin types. Make a thick paste of the ingredients, leave it on for 20 minutes and rinse. The result will be glowing, radiant skin. « Make Drinking Water Fun!